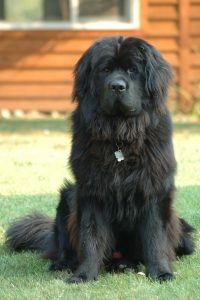 The Newfoundland, also known as the Newfie, the Gentle Giant or the Blackbear is a powerhouse of a dog. It is generally accepted as probably the strongest of any breed, including Irish Wolfhounds, Mastiffs and Great Danes. They were originally bred to work alongside fishermen in Newfoundland, Canada, and are noted for their huge size, sweet, even temperament and loyalty to their owner. Newfoundlands have webbed feet, a water resistant double coat and are excellent swimmers; rather than ‘doggy paddle’, they move their legs in a style more akin to a breaststroke. Newfoundlands are celebrated for their water rescue abilities. The most common colours for a Newfoundland are black, black with white markings, black with blue highlights, brown and grey. White dogs with black markings are know as Landseers, and are considered as Newfoundlands in the UK and America. However, in Europe Landseers have longer legs and less muscle mass, and so compete separately in dog shows. 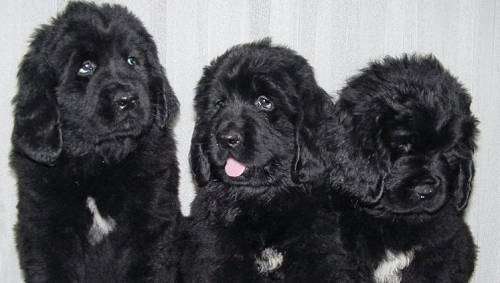 Newfoundlands have a double coat; the outer coat is thick and coarse, whilst the undercoat is dense, oily and soft. Your Newfoundland will require daily or weekly brushing with a hard brush and its undercoat will usually shed in the spring and autumn. Extra care with grooming is required at these times. Newfoundlands that live indoors tend to lose their undercoats. It is best to avoid bathing unless it is absolutely necessary, as the natural oils in the coat will be stripped away. Instead of bathing, dry shampoo occasionally. Newfoundlands can be susceptible to hip or elbow dysplasia, which is a malformed hip joint. However, lots of breeds are prone to this, especially larger ones. Some Newfoundlands may have hereditary cystinura, or bladder stones, and a smaller proportion may have subvalvular aortic stenosis, which is a heart defect. Newfies are intelligent dogs, and are sweet natured, calm and very obedient. They are natural nursemaids, and are one of the best dogs to have around children. They are easy to train, and their deep, loud bark makes them an ideal watchdog. The Newfoundland’s even temperament also means that they are great to have around other animals and pets. Obedience training is essential with a Newfoundland. It is best to start training your dog at an early age, as their size and strength when they reach adulthood will make them a real handful to control. They are sensitive to your moods, so you should be careful not to lose your temper or your patience with them, and you should give them praise whenever they deserve it. Newfoundlands, especially males, are no pushover to train; they will expect you to prove to them that you are the boss, so it is important that your leadership is firm and consistent at all times. They are naturally cautious, so it is advised that they are socialised at a young age by exposing them to different people and places. Exercise is very important for your Newfoundland’s wellbeing. It’s advisable not to over exercise a younger dog, but adult dogs will need more. Newfies are content to laze around your house all day, so a daily walk is essential. Due to the Newfoundland’s size, they are not the most mobile of breeds so it’s best not to ask too much of them. As a working dog, it’s a great idea to let them do what they were bred for; Newfies love to swim and pull heavy loads. It’s well worth investing in a dog cart for your Newfoundland as he will love pulling it along. The breed originated on the Canadian island of Newfoundland, and descended from a breed native to it called the St John’s Dog. There is speculation that Newfoundlands were also descended from Bear Dogs introduced by the Vikings as far back as 1000 AD, but there is no evidence to support this. 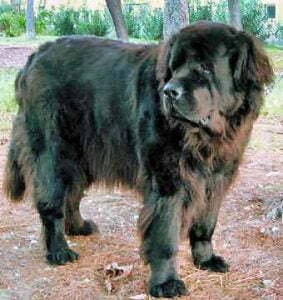 Their ancestry can be traced back to the Alpine Mastiff however, and the Newfoundland shares a lot of characteristics with other rescue dogs of the same lineage, such as the St Bernard and English Mastiff. By the time that colonisation of the island was allowed in 1610, many of the Newfoundland’s characteristics were in place and, in the 1880s, English and Irish explorers who had travelled to the island had described the dog. They noted that the Newfoundland was used to pull in fishing nets and carts, haul timber, deliver goods and haul other equipment. They also brought back many tales of drowning and shipwrecked men being saved by the breed, and its other exploits and adventures. Newfoundlands were driven to the edge of extinction in 1780. Richard Edwards, the then Commodore-Governor of Newfoundland, decreed that households were legally limited to owning one Newfoundland in an effort to encourage sheep rearing. Many dogs were destroyed or exported, and it was only due to the tenacity of the island’s inhabitants that the breed was able to survive there. The Newfoundland’s bravery and strength has long made it the choice of explorers, too; American explorers Lewis and Clark took a Newfie named Seaman on their expedition across America in 1804. Newfoundlands were popular in the United Kingdom up until the advent of World War I in 1914, and again up to World War II which began in 1939. War time restrictions meant that the Newfoundland’s numbers were almost fatally reduced, but they were used by the armed forces to haul arms and supplies for the Allies in sub zero temperatures in Alaska and the Aleutian Islands. Since then, the breed has firmly established itself in the UK. There are many examples of famous Newfoundlands, and several have inspired artistic works. Boatswain, who belonged to Lord Byron, moved him to write the poem ‘Epitaph to a Dog’. 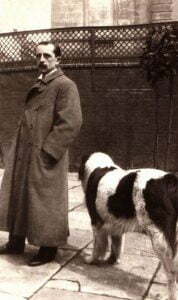 J. M. Barrie was inspired to included ‘Nana’ as a pet of the Darling family in Peter Pan, by his own dog Porthos. Ann Harvey rescued 163 shipwrecked people off the coast of Newfoundland in 1828, along with her father, brother and pet Newfie Hairy Man. Several US Presidents have also owned Newfoundlands, including Ulysses S. Grant, Rutherford B. Hayes and James Buchanan.